This color-composite image of the Helix Nebula (NGC 7293) was created from images obtained by the Wide Field Imager (WFI), an astronomical camera attached to the ESO telescope at the La Silla observatory in Chile. 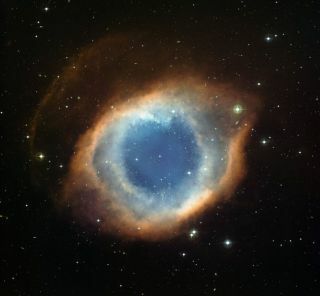 A new image of the Helix planetary nebula shows arich background of distant galaxies. Astronomers used the European Southern Observatory's (ESO) La SillaObservatory in Chile to capture the view. The Helix Nebula (NGC 7293) lies about 700 light-yearsaway in the constellation of Aquarius, or the Water Bearer. It is one of theclosest and most spectacular examples of a planetary nebula. These exoticobjects have nothing to do with planets, but represent the finalblooming of Sun-like stars before their retirement as white dwarfs. Shells of gas are blown off from a star?s surface, andshine under the harsh ultraviolet radiation from the faint, but very hot,central star. The main ring of the HelixNebula is about two light-years across, or half the distance between theSun and its closest stellar neighbor. Despite being photographically very spectacular, theHelix is hard to see visually as its light is thinly spread over a large areaof sky. The history of its discovery is also rather obscure. It first appearsin a list of new objects compiled by the German astronomer Karl Ludwig Hardingin 1824. The name Helix comes from the rough corkscrew shape seen in theearlier photographs. Although the Helix looks very much like a doughnut,studies have shown that it possibly consists of at least two separate discswith outer rings and filaments. The brighter inner disc seems to be expandingat about 62,137 miles per hour (100 000 km/h), and probably formed over 12,000years. Because the Helix is relatively close — it covers an areaof the sky about a quarter of the full Moon — its complex structure can bestudied in much greater detail than most other planetary nebulae. All aroundthe inside of the ring are small blobs, known as ?cometary knots,? with fainttails extending away from the central star like droplets of liquid running downa sheet of glass. Although they look tiny, each knot is about as large as ourSolar System. These knots have been extensively studied, both with theESO Very Large Telescope and with the NASA/ESA Hubble Space Telescope, butremain only partially understood. A careful look at the central part of thisobject reveals not only the knots, but also many remote galaxies seen throughthe thinly spread glowinggas. Some of these seem to be gathered in separate galaxy groups scatteredover various parts of the image.